What to do on a Winter Day in Toronto, Canada, originally uploaded by Mic2006. 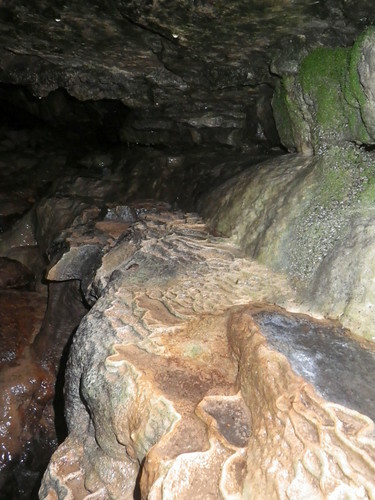 The above picture is of the inside of Travertine Cave, which is situated at location near Toronto, Canada. We visited one winter day quite recently. While at University I often remember sitting there wondering what I could find to do aside from studying (of which I did precious little) (Toronto University, or possibly University of Guelph, or McMaster University – Hamilton, are close to here). In the accompanying video – What to do on a winter day in Toronto Canada – Ice Caving Adventure (Toronto University) I detail my attempts to explore the cave and the unfortunate accident that I had which now leaves me aching and bruised. Of particular interest was the observation that deeper into the cave – well past the flowing water at the entrance, was the realization that water was also flowing outward from within. I had always thought that Travertine Cave was simply a shelter that had formed as Tufa seeped over the edge of a low cliff. Water flowing from within might suggest the possibility of a solution cave and tunnels that are more extensive than I had imagined. 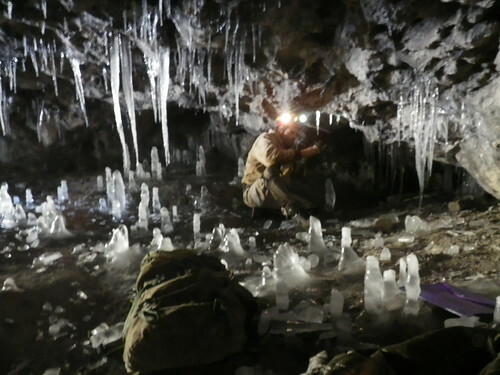 The ice formations in Travertine Cave were also very unusual. 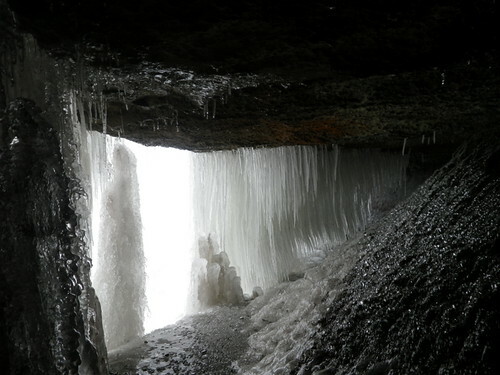 A strong breeze blows through the cave and the resulting icicles are flat and bladed with square protuberances at the bottom of each hanging pendant. I am left wondering what freak of climate or geography would so consistently create that unusual shape amongst not one, but all of the icicles hanging in a certain area of the entry grotto. Big shelter cave in the Elora Gorge, originally uploaded by Mic2006. JC and I have had some difficulty in locating these caves in the Elora Gorge, there are plenty of rumors out there, but because of the difficulty in viewing this area, with slippery ice and cliff edges that seem to blend into the drifted snow these caves had gone un-noticed until today. As many of us live such an urban lifestyle most are hesitant to enjoy the winter – or at least the winter beyond the limits of a local ice rink. A ramble up the Elora Gorge is definitely a cool thing to do if you live in or near Toronto. The ice formations are amazing, especially with the warmer temperatures as of late and the rapid freeze to grow these incredible icicles. There was also an interesting bed of octagonal foam rafts that had floated down the river and gathered in an eddy. I managed to get down to the river and grab one. It was ice with a top of foam that had frozen. by their rubbing against each other the ice rafts had all developed this unusual geometric appearance and at their outer edge the rafts were being jostled out into the river and sucked back into the eddy further down to replenish the back end of this constantly moving carpet. It was like a natural conveyor belt. Sadly – as much as photographing the ice formations is a cool thing, it looks like we will have to either wait for summer to reach the caves in the above picture, or we will have to wade across the river in less than ideal conditions. As seems to be the pattern, all caves that I’ve seen in the Elora Gorge are simple shelter caves – shallow cavities that have been scooped out by the water. Admittedly the caves present some interesting opportunities, but I’m not sure I’m ready to wade across the river in these temperatures. There also appears to be a possible scramble down the opposite cliff face. I will have to scout that out next weekend if I’m not with JC looking for abandoned gypsum mines – the landscape south of Hamilton is littered with them. JC just e-mailed to say that he visited a buried adit today from which 60 000 tonnes of rock had been removed. The land owner says that he had felt a breeze coming from there in the summer. So will it be looking for caves or abandoned mines next weekend? One question – who is looking for a cave near Kingston? Do you know something that I don’t? Leave a message so I can contact you – your lead and the knowledge of my various contacts might be able to locate the treasure for the both of us. 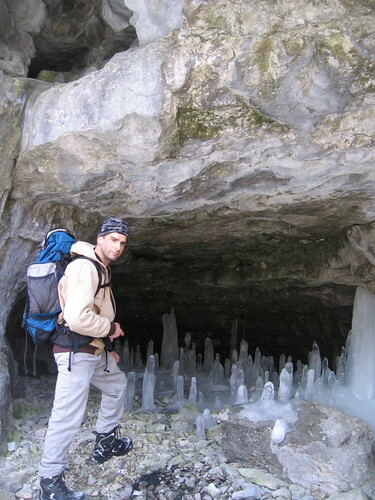 Ice Formations in a shelter Cave – Canada (Elora Gorge, Ontario), originally uploaded by Mic2006. Further to my exploration of Canadian geography in the the winter, JC and I found an icy precipice down which we could slither into the Elora Gorge. Being more agile JC had led the way, and I followed tentatively, wondering if I could make my way back up again. Admittedly it’s been too long and my lack of confidence was misplaced, tree roots, hanging branches and rocks made for easy climbing and soon our discovery of cool ice formations and a frozen waterfall led me to believe that the effort had been worthwhile. JC had found a picture of a low slot-like cavity on Flickr, I recall seeing this years ago, but it was never so exposed above the water. Either the water has got lower in the Elora Gorge or my memory is faulty. Elora Gorge is mentioned in several caving manuscripts for it’s shallow shelter caves, and as there are usually more challenging explorations around, I’ve never really paid too much attention – but today, we’re just marking time till warmer weather and then it’s back to real caving. 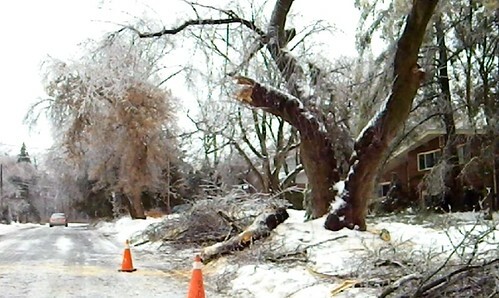 If you are looking for cool things to do near Toronto, a visit to the Elora Gorge would certainly top my list – Just be sure you’re safe, the edge of the gorge is very dangerous, especially in the winter. We figured that we could reach the slot pictured on flickr by descending into the gorge and then picking our way along the river bank. Sadly this was not possible as the river cut off our expected riverbank access. This hollow might well be a shelter cave, but in looking at the sloping rock wall above it I wonder if it might again be some kind of tuffa formation. You will possibly remember my posts on Travertine Cave, there are some spectacular formations within it (See my book Caving in Ontario; Exploring Buried Karst – here) and if the river level has dropped and opened this new passage, I wonder if there are similar hidden treasures – but then again its probably like all the others, a rather disappointing shelter cave. Any way when we realized we could not reach our intended destination we headed down stream and discovered this cavity in beneath a joint. Elora has beautiful thick bedding planes in many places (lower down) and so you never know what you might come across. Being formed by running river water from the gorge, this cavity does not go in too far, but being curious – cavers usually are, JC stood on my shoulders and as I stood, he hand-walked up the wall to get a look inside the tunnel up above, it too was relatively short. 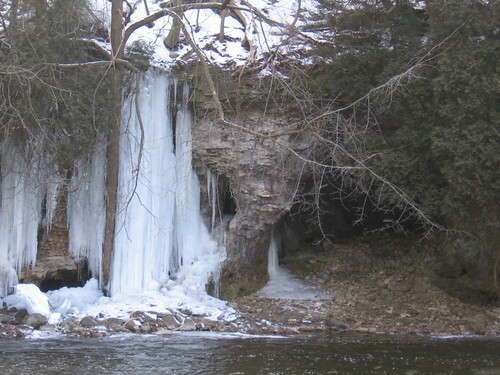 The real treat in Elora are the ice formations, and the frozen water falls – here is one that I saw. Short of re-visiting in the summer to check out the river level slot, winter is the time to go there. I’ve heard rumor of a few other caves along the river bank – does anyone want to share?